[ swift shifts followed, and many Epeians embarked on them. sons, the one of Kteatos, and the other of Eurytos, the two sons of Aktor. Actor made her his [vigorous] wife. Other surviving examples are far more clear in their depiction of two men fighting as one (see examples in Snodgrass 1998). These vases are telling a story, and an epic one at that. οὐ γάρ πώ τί μ᾽ ἔφη ἴδμεν πολεμήϊα ἔργα. ἣ τόσα φάρμακα ᾔδη ὅσα τρέφει εὐρεῖα χθών. ἡγεμόν᾽ ἱππήων, ὃς ἀριστεύεσκε μάχεσθαι. φῶτες ὀδὰξ ἕλον οὖδας ἐμῷ ὑπὸ δουρὶ δαμέντες. ἐκ πολέμου ἐσάωσε καλύψας ἠέρι πολλῇ. for he said that I did not yet know the deeds of war at all. who knew as many drugs as the wide earth grows. the leader of their horsemen, who was the best at fighting. men bit the ground with their teeth, subdued by my spear. οὕνεκα δὴ τὰ μέγιστα παρ᾽ αὐτόθι λείπετ᾽ ἄεθλα. ἔμπεδον ἡνιόχευ᾽, ὃ δ᾽ ἄρα μάστιγι κέλευεν. because the biggest prizes were left for that event. Obviously, Nestor has reason to portray them as formidable, but he/the poet could have chosen any number of opponents to fill the narrative function for which the Aktorione Molione are used here. It seems likely that the Aktorione Molione were traditionally associated with fearsome prowess, and that in the poetic traditions in which Nestor featured as a youth they were traditionally opposed to him. Those traditions are primarily known to us now through Nestor's memories related in the Iliad, but they may well have been at one time the subject of their own songs. Mary Ebbott and I discuss Herakles' ambush of the Aktorione Molione as an example of the epic pattern in which a formidable enemy who can't be defeated in battle is taken down instead by ambush tactics (see Dué and Ebbott 2010:98). Rhesos, who is killed by Odysseus in and Diomedes in Iliad 10, is one such hero, but there are quite a few other examples. Apollodorus adds additional details to the story as told in Pindar: Herakles had made a truce with the Aktorione Molione because he was ill, but they attacked his army and killed many while Herakles retreated. He then ambushes them on their way to the Isthmian games. The key sequence is that Herakles ambushes them because earlier he could not defeat them in a standing battle. 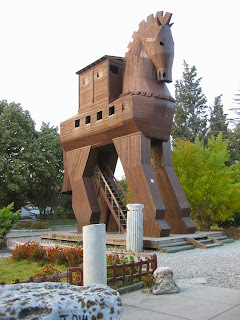 Within the tradition of the Trojan War, the primary example of this kind of ambush is the use of the wooden horse to ambush and defeat the Trojans when ten years of polemos alone cannot. And now finally I return to the bronze fibula with which I began. We now know that the Aktorione Molione are depicted, and we know why they look as they do, with seemingly one body, four arms and four legs. But who are they fighting? 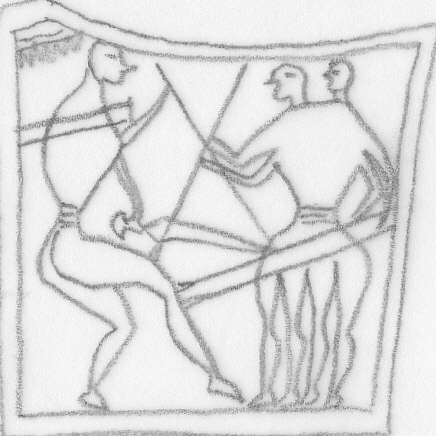 The museum's description says they are fighting Herakles. But if indeed the Aktorione Molione, like Rhesos, could only be killed by ambush, it is much more likely that they are fighting Nestor (or another warrior) in conventional battle. Cantieni, R. 1942. Die Nestorerzählung im XI. Gesang der Ilias (V. 670–762). Zurich. Coldstream, J. 1991. "The Geometric style: the birth of the picture." In T. Rasmussen and N. Spivey, eds., Looking at Greek Vases. Cambridge. Dué, C. and M. Ebbott, eds. 2010. Iliad 10 and the Poetics of Ambush. Washington, DC. Frame, D. Hippota Nestor. 2009. Washington, DC. Snodgrass, A. 1998. Homer and the Artists: Text and Picture in Early Greek Art. Cambridge. *My translations from Iliad 11 and 23 were made together with Douglas Frame, Mary Ebbott, Leonard Muellner, and Gregory Nagy. See also Frame, Hippota Nestor (Center for Hellenic Studies, 2009), Part II chapter 4: https://chs.harvard.edu/CHS/article/display/5480. In this post I propose to explore the relationship between the discipline of archaeology and the Homeric Question, taking Orchomenos as a jumping off point. In so doing my aim is not so much to show something new about this relationship or to offer a new interpretation of the verses concerning Orchomenos, but rather to take this opportunity to give an overview of an important topic within the history of Homeric scholarship that has many implications for our understanding of the oral tradition in which the Iliad and Odyssey were composed. This post will focus on the history of the relationship between archaeology and the Homeric Question; future posts will address more theoretical aspects. As I have noted in a previous post, the work of scholars such as E.S. Sherratt and Gregory Nagy demonstrates that we should not be searching for a single era of history or a single political reality to be reflected in the Catalogue of Ships. The Catalogue of Ships—its content, its formulaic diction and structure, and its poetics—evolved as the Iliad evolved. But in fact it has been common in the history of Homeric scholarship to attempt to link the Catalogue to particular historical eras. These attempts have been closely linked to developments in archaeology, which have offered the possibility of connection between material reality and the poetry that has come down to us. Orchomenos depicting warriors in boar tusk helmets. Boiotian Orchomenos makes an excellent case in point. 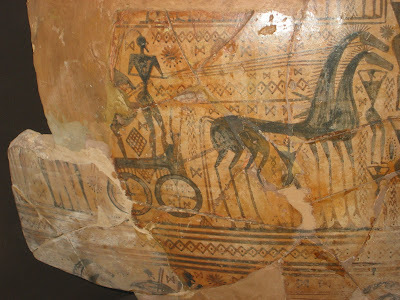 Orchomenos was an important Bronze Age palatial center with frescoed walls and tholos tombs. Its first excavator was none other than Heinrich Schliemann, the first excavator of Hisarlik, which is the site believed by many to be the Homeric Troy. Schliemann went looking for Orchomenos precisely because he remembered Orchomenos as one of only three places in the Iliad said to be "rich in gold" (Schliemann 1884:303). The other two places are of course Troy and Mycenae, both of which, as we will see, Schliemann himself excavated with spectacular results. We will turn to these more famous excavations momentarily, but let us note for now that Schliemann seems to have been mistaken about the text of Homer. I can find no passage where Orchomenos is described as being polukhrusos ("rich in gold"), though Achilles does cite it as one of the two cities, along with Egyptian Thebes ("where the greatest amount of possessions lie stored in the houses"), whose riches he would reject if Agamemnon offered them to him (Iliad 9.381). And its so-called "treasury of Minyas" (a Bronze Age tholos tomb like those found at Mycenae), was said by the Greek travel writer Pausanias to be one of the greatest wonders of the world (9.38.2). 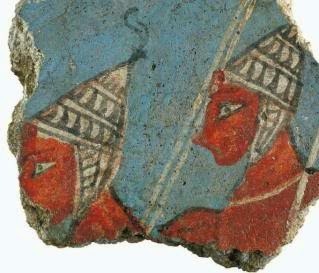 (For more on the Minyans, stay tuned for the next post!) In any case, Schliemann's excavations revealed Orchomenos to have been in fact a wealthy Bronze Age center, thus making it an important early example of a phenomenon that has caused scholars to want to understand the Catalogue of Ships as having its origins in Bronze Age. Like Orchomenos, many places in the Catalogue seem to have been at the height of their power and prominence in the Bronze Age, but were significantly less so in later eras. Orchomenos continued to be inhabited after the Bronze Age, but many other places in the Catalogue were not. Simpson and Lazenby (1970: 38-39) point out, however, that the Catalogue's description of Orchomenos does not actually capture it at the peak of its power when it controlled a series of settlements on the Northern shore of Lake Copais. In the Catalogue, these places appear to be in the domain of the Boiotians. Achilles' comment about the wealth of Orchomenos perhaps hearkens back to Orchomenos' heyday, but in the Catalogue at least, Orchomenos is not characterized as the wealthy and powerful place it once was. We have, it seems, more than one chronological reality for Orchomenos reflected in our Iliad. I would like to emphasize already now how closely poetry and archaeology have been intertwined in the case of Orchomenos. Schliemann wanted to excavate it precisely because it was spoken of as a wealthy city in the Iliad. The prospect of Bronze Age gold was certainly a motivation, but so too was the desire to find a historicity in the poem. By finding and excavating the major cities featured in the poem, Schliemann hoped to prove the truth of the Iliad. His excavations at Hisarlik were inextricably bound up in this same desire, and so too have all subsequent excavations been - even, I would argue, contemporary excavations that profess not to be. The result is that we cannot separate the archaeology of the Troad, nor even the Greek Bronze Age more generally, from the Homeric Question. They have gone hand in hand from the beginning. In the late nineteenth century a wealthy businessman, Heinrich Schliemann, took it upon himself to excavate the mound known as Hisarlik in northwestern Turkey. Schliemann, who was born in 1822 and died while excavating at Hisarlik in 1890, was explicitly searching for the Troy of the Homeric poems, claiming to have had a desire since childhood to find the walls of a historical Troy. (See, for example, the "Autobiographical Notice" included in Schliemann's 1875 account of the first excavations at Hisarlik, Troy and its Remains.) Few people believe Schliemann's romantic tale about this childhood dream, as Schliemann had a well documented gift for embellishing the events of his life in his letters and diaries. (The evidence for embellishment and outright falsification of events and discoveries has been gathered primarily by William Calder and David Traill; see Calder and Traill 1986 and Traill 1993. A balanced account of Schliemann's life may be found in Moorehead 1997. For more critical views, see Traill's 1995 biography and Allen 1999, with further bibliography ad loc.) In fact, when Schliemann first visited the Troad in 1868, the precise location of Troy was being hotly debated by scholars throughout Europe, and it is in that context that Schliemann likely first conceived of digging up the "real" Troy. 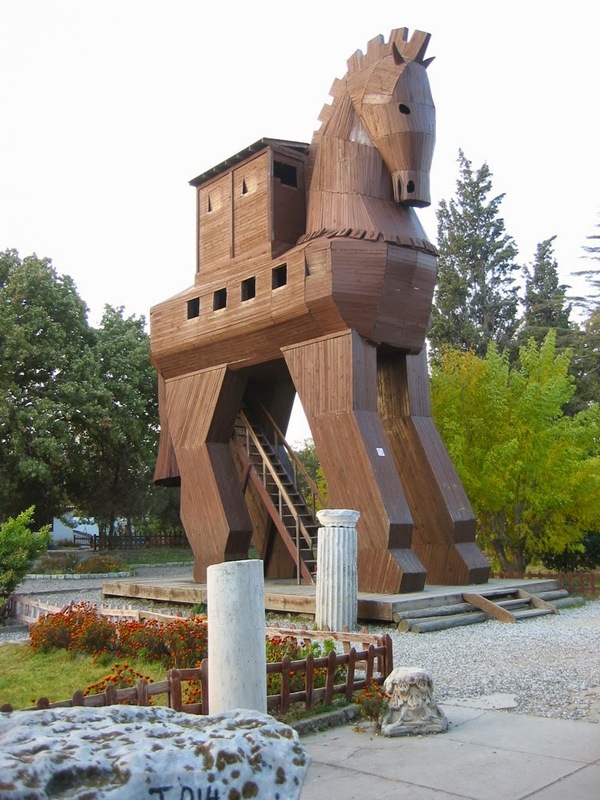 The ancient Greeks themselves believed the Trojan War to be a historical event (as we find it discussed for example in the histories of Herodotus and Thucydides), and they dated it to around 1250 BCE (though there were competing alternatives). The ancients also believed they knew where Troy was located: a place called New Ilium (which was inhabited from approximately 700 BCE to 500 CE) was said to have been built from the ruins of Troy. This city was founded at a time when many different groups were staking claims to epic poetry and the Trojan War. Probably the Iliad and Odyssey were crystallizing into the forms in which we now read them around this time, and this development may explain the intense interest in the region. (For scholarly arguments, see Nagy 2010: 142-146. For a more general overview of the topic, see Wood 1998: 19-46.) Multiple tumuli in the area were believed to be the tombs of heroes such as Achilles and Ajax (Burgess 2006). In antiquity this presumed site of Troy was visited by Xerxes, Alexander the Great (“He ran naked to the tomb of Achilles and laid a wreath there, while his close friend Hephaistion performed similar rituals at a nearby mound identified as the tomb of Patroklos.” [Burgess 2006]), Julius Caesar, Constantine, Julian, and Mehmet II. But in Schliemann's day debate about the true site of Troy was fiercely raging. The modern search for Troy has its origins in the work of Robert Wood, whose Essay on the Original Genius and Writings of Homer with a Comparative View of the Ancient and Present State of the Troade (1769) made deductions about changes in topography since ancient times (it was also one of earliest formulations of arguments concerning oral composition and transmission of the Homeric poems). Wood's speculation on the possible historicity of the Trojan War and the location of Troy itself inspired countless others, including Jean Baptiste Lechevalier (1791) who argued that the site of Troy must be at a place called Burnabashi [Pinarbaşı] and asserted the historicity of Trojan War, which sparked fierce debate. Although some scholars had singled out the mound of Hisarlik, the acropolis at New Ilium, as the most likely candidate for the Homeric Troy, few seem to have given it serious thought, and when Schliemann visited the Troad in 1868, Burnabashi was the focus of his attention (Allen 1999: 5-9). Because Schliemann was specifically looking for the Troy of the Iliad, he had no interest in the Classical and other ruins present at the site. We now know that Hisarlik was continuously occupied for 4000 years, from approximately 3000 BCE to 1000 CE. (For an overview of all nine layers of occupation see Bryce 2006: 29-86 and 151-179.) It is one of the longest continuously inhabited settlements in human history, which should not surprise us given its strategic location. 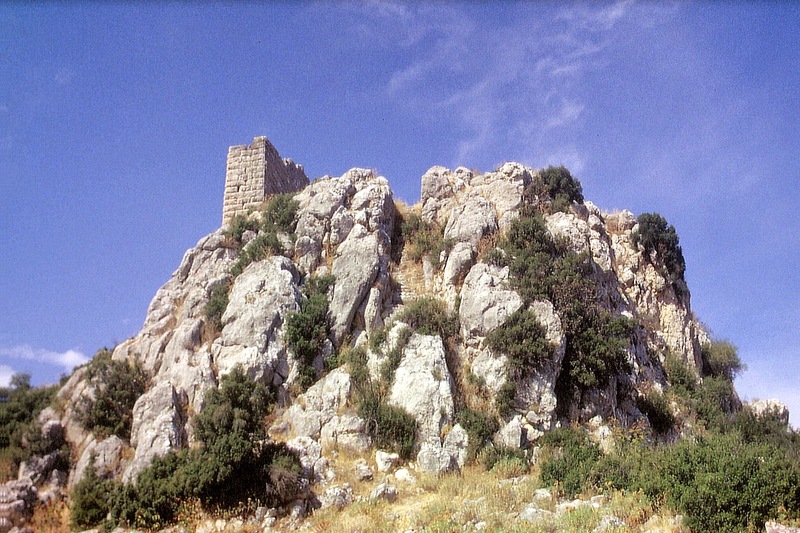 Schliemann assumed that the Homeric Troy would be at the bottom of the mound, not realizing that the site had been occupied for nearly two millennia before the traditional date of the Trojan War. He therefore proceeded to plough through the upper layers, destroying much of the Bronze Age remains (and everything else). At the second layer from the bottom (contrary to current archaeological practice, Hisarlik's layers are numbered from the bottom up) Schliemann found a fortified citadel that arguably resembled the Homeric Troy. Troy II (as it is now conventionally called, on the assumption that Hisarlik is indeed Troy) was a highly prosperous community with advanced metal technology. The city had two main gates, a steeply rising monumental ramp, stone walls, impressive, sloping fortifications, and a large megaron style building. Elites lived in spacious buildings on the citadel, while others probably lived outside the walls. Troy II, moreover, was destroyed by fire. For Schliemann, all the pieces fit together to support his thesis that a Trojan War had taken place on this site and given birth to a monumental epic poem that chronicled its events with historical accuracy. 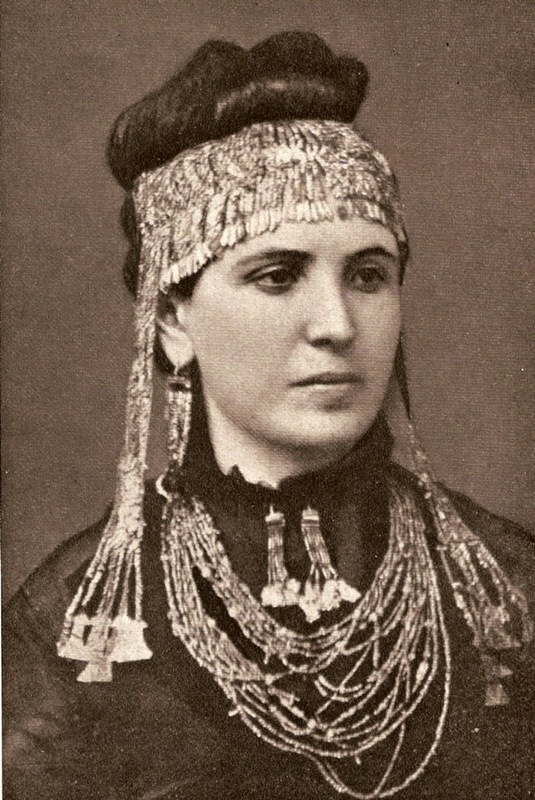 wearing the "Jewels of Helen"
Schliemann was convinced that he had found the Homeric Troy and began to publish his findings, but the scholarly world was skeptical. Troy II is only 100 yards in diameter. Could such a small place be the Troy of the Iliad? In 1873, with criticism mounting and the third and final full season of excavation coming to a close, Schliemann astonished the world with a spectacular discovery. On a day when the Turkish overseer was working at another part of the site Schliemann claims to have found in the remains of Troy II a horde of precious objects that he termed the “treasure of Priam,” or as they came to be quickly known, the “jewels of Helen.” (Let us note once again the immediate connection made between the archaeology and the poetry here. Schliemann never seems to have doubted that a real king Priam ruled at Hisarlik, or even that Helen was a real individual with jewels that could be found.) It is abundantly clear that Schliemann fabricated many details of his various conflicting accounts of the discovery and even the exact find spot, though most scholars accept the finds as genuine (Allen 1999: 3 and Bryce 2006: 50). Some have expressed doubt that the objects come from a horde; they may have been discovered over the course of several weeks or months and assembled to make a more impressive find. (See especially Traill 1995: 110-124.) In any case, the publicity surrounding the treasure caused public opinion to turn in Schliemann's favor, and it seemed the Homeric Troy had been found. We now know that this level at Hisarlik (the so-called Troy II) dates to 2500-2200 BCE, a thousand years before the conventional date of the Trojan War, or, as the scholar Trevor Bryce puts it, "far too early for Priam's Troy" (Bryce 2006: 50). Of course, there is no reason why we must assume a Trojan War occurred at this site at all, or that it took place, if it took place, circa 1250 BCE. As we will see, however, later excavators who, like Schliemann, were looking for the Homeric Troy found another level of habitation that is a far more likely candidate for the setting of the Iliad. This layer, known as Troy VI, flourished for approximately five hundred years between 1700 and 1200 BCE, temptingly in range of the dates given in antiquity for the Trojan War. Unfortunately, most of the remains of Troy VI were destroyed by Schliemann's excavations. The so-called "Mask of Agamemnon"
Ignorant of this chronology and in deep trouble with Turkish authorities after smuggling "Priam's Treasure" out of Turkey, Schliemann turned his attention to Greece. He had found Troy, so why not excavate Mycenae as well, the home of Agamemnon, leader of the Greek forces at Troy? Unlike Troy, there had never been any question as to the location of Mycenae; its ruins, including the massive "Cyclopean" walls and lion gate had been described by Pausanias and visited by modern travelers before Schliemann, including Lord Elgin. But no one had dug it up, and during excavations in Fall of 1876 once again Schliemann made spectacular finds that stunned the world, this time in the form of shaft graves containing large amounts of gold and other precious materials. These tombs were immediately associated with the Homeric heroes, as they had been already in Pausanias' day. A particularly spectacular funerary mask came to be known as the "mask of Agamemnon" and an impressive tholos tomb was called the "treasury of Atreus" (as they are still called to this day). It is clear that Schliemann had uncovered an important Bronze Age civilization, one that was previously unknown in modern times. He discovered it because he was looking to prove the historicity of the Iliad, and in the sense that he proved the existence of a palatial civilization at the end of the Bronze Age in Greece, one resembling the wealthy and powerful Mycenae of the Iliad, he was arguably successful. The Homeric world of kings and palaces, so foreign to later eras of Greek history, was shown to have once existed. But as always, Schliemann's archaeology was skewed by his desire to match up the archaeological remains with the Iliad. In fact the gold of the shaft graves, which have since been dated to the 16th century BCE, postdates Troy II by more than seven hundred years, and predates the traditional date of the Trojan War by three hundred years. It is in the wake of these spectacular finds at Mycenae that Schliemann went on to excavate Orchomenos and Tiryns. Tiryns proved to be another spectacular and massively fortified Bronze Age citadel in keeping with it's Iliadic description (it is called "walled" at Iliad 2.559, one of only two cities so designated.) Orchomenos he left after only a few weeks, not having found any gold after all despite what the Iliad has to say. What he did find at Orchomenos was a type of pottery that he called "Minyan Ware" (after the Minyans of Greek myth). 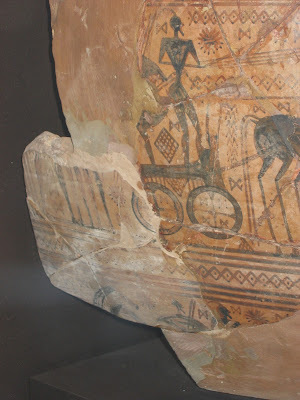 Schliemann himself did not make the connection, but this type of pottery had also been found at Troy, at a level that Schliemann did not believe to be prehistoric (Wood 1998: 71-72). This level would turn out to be Troy VI, the one now regarded by many as the Homeric Troy. Schliemann also attempted to get permission to dig at the site of Knossos on Crete, where he might have uncovered the Minoan civilization later discovered by Arthur Evans, but he was not able to get permission to dig there, as Crete was fighting for independence from Turkey. And so Schliemann returned to Troy, this time with the architect Wilhelm Dörpfeld, with whom he had excavated at Tiryns. He was determined to prove that there were links between Mycenae, Tiryns and Troy II. But it seems that even he had doubts that so small a place could be the subject of the Iliad. In his account of Schliemann's excavations, Michael Wood quotes a letter in which Schliemann writes: "I thought I had settled the Trojan question forever... but my doubts increased as time wore on. ... Had Troy been merely a fortified borough, a few hundred men might have taken it in a few days and the whole Trojan War would either have been a total fiction, or it would have had but a slender foundation." (See Wood 1998: 87.) These words reveal a great deal about Schliemann's hopes and assumptions concerning the relationship between the archaeological remains, the history of the Bronze Age, and the poetry of the Iliad. To discover that the Iliad was an entirely poetic creation, with no basis in historical fact, would have been a tremendous disappointment to Schliemann. Even the idea that the Iliad might contain a kernel of historical fact that had been embellished by time and poetry was unacceptable. Schliemann's sentiments are in keeping with an often quoted diary entry of Lord Byron, who wrote: “We do care about ‘the authenticity of the tale of Troy’… I still venerated the grand original as the truth of history (in the material facts) and of place. Otherwise it would have given me no delight” [written in his diary in 1821]. From the ashes of Troy V a splendid new settlement emerged, which, at the height of its development, far overshadowed its predecessors in size and magnificence, and provided the setting for the most famous epic in Western literary tradition. For this was the place where Homer located the kingdom of Priam. Before its walls, Greek and Trojan forces repeatedly clashed, and Achilles and Hector fought to the death. At least that is what tradition tells us. Bryce was writing more than a century after Dörpfeld, but his description captures the spirit with which Dörpfeld conducted his work, following in the footsteps of Schliemann himself. Poetry and archaeology are made to reinforce one another in order to create a vivid historical picture of a real Homeric Troy at Hisarlik, where the events of the Iliad could have actually occurred. (For the ecstatic reception of Dörpfeld's findings among academics of the time, see Wood 1998: 89-93.) After Dörpfeld came Carl Blegen, an American archaeologist who excavated at Hisarlik from 1932-1938. He too was looking for a Troy at which the events of the Iliad and the Trojan War of the larger epic tradition took place and he believed that Troy VIIa, the level immediately following Troy VI, was the Homeric Troy. Unlike Troy VI, which showed little evidence of war as a cause for destruction, Troy VIIa was a town arguably destroyed by siege some time around 1180 BCE. As Bryce notes, however, this would be "too late to be linked with a concerted Mycenaean invasion from the Greek mainland" (Bryce 2006: 67). The Mycenaean palaces had collapsed by this point, as had many power centers around the Mediterranean and the Near East. Once again the reality of the archaeological remains of Hisarlik fails to match our preconceived poetic and historical narratives. And yet we continue to look. Because Troy VI seems so tantalizingly like the city of the Iliad, we can't let it go. And so the excavations have continued. In 1988, fifty years after Blegen, new excavations began under the direction of Manfred Korfmann and continued after Korfmann's death in 2005 until 2012. Korfmann's team identified a a previously unknown extensive lower town surrounding Troy VI, fortified by mudbrick walls and ditches. (We should note, however, that there has been considerable revisions to the dates and renaming of the various levels.) These findings suggest that Troy VI was much bigger even than previously thought and an important regional power. Korfmann stated repeatedly in interviews and on the project website that his team was not interested in proving or disproving the historicity of the Trojan War. It is noted in his New York Times obituary, for example, that for Korfmann, the Trojan War “was merely an illustrative and metaphoric episode in a series of many wars that undoubtedly were waged through the centuries in the power play at this strategic place” (New York Times Obituary, 8/19/2005). Korfmann urged us to see Hisarlik as an archaeological site well worth studying in its own right. But it is a fact that Korfmann's findings were seized upon by Homeric scholars wishing to prove the historicity of the Trojan War, as narrated in the Iliad. Joachin Latacz, described as "one of Korfmann's closest collaborators" on the back of his 2005 book Troy and Homer: Towards a Solution of an Old Mystery, argues forcefully on the basis of Korfmann's evidence that the Iliad transmits historical events from the late Bronze Age. In 2001, the findings of the excavation were the subject of a special exhibition in Germany entitled Troia: Traum und Wirklicheit ("Troy: Dream and Reality"). The title alone perfectly encapsulates the problem of separating fact and fiction when it comes to the site of Hisarlik: Troy is a dream that archaeologists have time and again sought to prove a reality at Hisarlik. The exhibit was fantastically well attended and ignited a media firestorm after one of Korfmann's own colleagues at the University of Tübingen, Professor Frank Kolb, accused him of falsifying his results and deliberately misleading the public. While I do not endorse Kolb's accusations, I can understand his skepticism. Once again the archaeological site of Hisarlik was being used to support century old arguments about the historicity of the Iliad. Indeed, I would argue that modern scholars are no less romantic than Schliemann himself when it comes to the archaeological aspects of the Homeric Question. 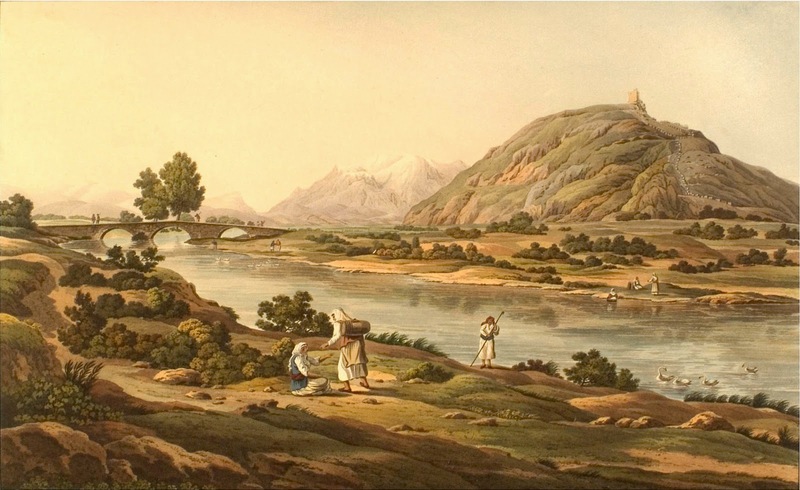 How far have we come since the days of Schliemann in our understanding of the relationship between the archaeology of the mound called Hisarlik in Northwestern Turkey and the Homeric poems? An instructive example can be found in Trevor Bryce's 2006 book, The Trojans and their Neighbours, which is an excellent scholarly treatment of what we know about the archaeological evidence at Hisarlik, situated in the wider context of the Bronze Age Mediterranean and the Near East. It is one of the latest, most up to date textbooks on this subject and I use it in my own classes. The book is full of problematic assumptions about the relationship between Hisarlik and the Homeric epics, including the following. It is important to understand that all of these are assumptions, and all have a chance (in some cases a very strong chance) of being incorrect. So why does Bryce assume them? He does so for the same romantic reasons that all scholars and archaeologists who research the site of Troy have, in varying degrees. It is the reason there is a monumental wooden horse at the site of Hisarlik today. Elsewhere I have argued that contemporary notions of poetic genius have influenced our understanding of the authorship of the Homeric epics in profound ways (Dué 2006). As I conclude in the article I have just cited, "Our evidence is such that however we dream up Homer it is of necessity a matter of faith and will always be rooted in current conceptions of poets and poetry." The archaeological search for Troy, I submit, is similarly wrapped up in modern conceptions about not only poetic genius but also the weight and significance of history, and a desire to find a kind of gravitas in the Homeric epics that we moderns do not typically associate with myth. The larger issue raised by my survey of the localization of Achilles' tumulus is the relation between myth and reality. The spectacular discoveries of Schliemann gave license to a historicist approach to the myth of the Trojan war that turned out to be unwarranted, even if much valuable historical evidence was uncovered in the process. The Homeric poems are not guides to Bronze Age history and their allegiance is to mytho-poetic narrative, not reality. Especially troubling has been a disrespect for myth displayed by some explorers and archaeologists, an attitude that is readily applauded by our modern culture. The search for the “truth” behind the Trojan war is essentially a reductionist exercise designed to transform myth into a more valued reality. The oft-quoted comment by Byron, “We do care about ‘the authenticity of the tale of Troy’… I still venerated the grand original as the truth of history (in the material facts) and of place. Otherwise it would have given me no delight”, is emblematic of this attitude, all the more regrettable because it is the expression of, astoundingly, a poet. It is depressing to face the constant pressure from the media and our students to play the antimythology historicist game. For these reasons we should resist attempts to identify a “real” tumulus of Achilles (and, I would argue, a “real” Trojan war). Yet topography and archaeology provide important contexts for philological research. It would be unnecessarily limiting for philologists to consider the Trojan war narrative an exclusively notional construct. In terms of origins, it is significant that there was a Bronze Age city of Troy, in existence when Mycenaeans were prominent and war was common… The ancients valued their direct experience of the actual world featured in Greek mythology. The viewing of topography provided a very strong and immediate contact with a traditional past that was immanent within the physical landscape. Any opportunity for us in the modern world to see topography associated with myth should always be illuminating. Schliemann’s methodology, naiveté, and shady dealings have been fiercely and rightly criticized by modern archaeologists and historians, but his accomplishment, namely the discovery of a previously unknown Bronze Age world not unlike that depicted in the Homeric epics—the world now known as Mycenaean Greece—had a lasting and profound impact on our understanding of the Iliad and Odyssey and the historical context in which they were generated. In future posts I plan to explore how our knowledge of some the reality of Bronze Age Greece affects our understanding of the poetry. But on an even more fundamental level, we can now appreciate the Iliad and Odyssey as works that spans many centuries of composition and reception. What philologists and linguists have observed in the diction of Homeric poetry (namely, that there are very old forms alongside much newer forms of words) can now be observed on a material level, thanks to Schliemann and those who have succeeded him. In terms of the Catalogue of Ships, we can now understand it to be the product of, or at least have its origins in, a Bronze Age world. As I have already suggested in the case of Orchomenos, the Catalogue entries do not only reflect the Bronze Age, or even a single era within the long span of time that we call the Bronze Age. But understanding the Catalogue to be the product of such a long evolution helps us to appreciate why the poetic significance of a place like Orchomenos can shift within the poem, and why we should not look for a single reality to inform our understanding of the poetry. Allen, S. 1999. Finding the Walls of Troy: Frank Calvert and Heinrich Schliemann at Hisarlik. Berkeley. Bryce, T. 2006. The Trojans and Their Neighbours. New York. Burgess, J. 2006. "Tumuli of Achilles." Classics@ 3. Eds. R. Armstrong and C. Dué. Center for Hellenic Studies. Calder, W. and D. Traill. eds. 1986. Myth, Scandal, and History: The Heinrich Schliemann Controversy. Detroit. Cook, J. 1973. The Troad: An Archaeological and Topographical Study. Oxford. Dué, C. 2006. "The Invention of Ossian." Classics@ 3. Eds. R. Armstrong and C. Dué. Center for Hellenic Studies. Latacz, J. 2005. Troy and Homer: Towards a Solution of an Old Mystery. Oxford. Lechevalier, J. 1791. Description of the plain of Troy with a map of that region, delineated from an actual survey. Edinburgh. Luce, J. 1998. Celebrating Homer's Landscapes: Troy and Ithaca Revisited. New Haven. Moorehead, C. 1997. Lost and Found: Heinrich Schliemann and the Gold That Got Away. Schliemann, H. 1875. Troy and its Remains: A Narrative of Researches and Discoveries Made on the Site of Ilium, and in the Trojan Plain. London. Schliemann, H. 1881. Orchomenos. Leipzig. 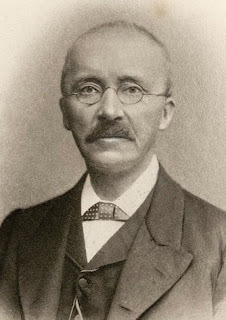 Schliemann, H. 1884. Troja: Results of the Latest Researches on the Site of Homer's Troy. London. Traill, D. 1993. Excavating Schliemann. Illinois Classical Studies supplement 4. ed. W. Calder. Atlanta. Traill, D. 1995. Schliemann of Troy: Treasure and Deceit. New York. Wood, M. 1998. In Search of the Trojan War. Berkeley.